The Only Pro and Amateur NET Tour in the area that pays! The 2018 regular season has come to a close. It was a record year in many respects at PGT. The 2019 season is right around the corner and looking to be just as good. The 2019 Schedule is coming together. What is confirmed is already posted and as other venues are secured, they will be added. We will kick off the season Sunday April 21 at The Lake Club again. This is a private Country Club and a fantastic course and facility. The PCS, Year Long Match Play, Player of the Year, and other competitions will again take place in 2019. Stay warm during the off season, and for anyone interested, we will be headed to Tampa Florida at the end of February for a spring trip to get the rust off in preparation for the 2019 tournaments. Keep a check on the Event Registration page for all details to be posted shortly. This is open to anyone (members, guests, and potential members). Call, text, or email PGT with any questions. AND, most importantly, please review the following link about the newest golf rule changes that will be in play this year. Brush up on them and we will be providing links to additional as the season moves forward. It will be a learning experience for all of us. Some of these rule changes may actually slow the game down, some will speed it up, but we will continue to emphisise ready golf at all times, being prepared for your upcoming shot, keeping up with the group in front of you, and not wasting time in general. The PGT Club Handbook has all of our rules, guidelines, code of conduct, and a link to the USGA rules website. All 2018 Leader Boards show final stats and winners of the various competitions. Also check the Trophy Room page for details. Congratulations to John Ramsbotham winning the NTC three day 54 hole competition in Flight A. 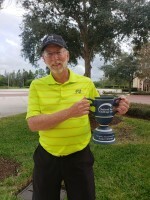 The 19th annual National Tour Challenge Nov 1-4 in Orlando Florida was another great trip. Individual and team competitions against Tours from Atlanta, Boston, Chicago, and Pittsburgh at Disneys Lake Buena Vista Course, Grand Cypress, and Shingle Creek. Atlanta takes the team competition. Many PGT players finished in the money and won alot of daily side game money. The 2018 season has come to a close. This was a record year for the PGT with all but 3 tournaments filled to capacity even with such miserable weather most of the year. We are already working on another great schedule for next year. Event locations and dates will be posted when they are confirmed.